With almost one in ten UK workers admitting to recent drug use1, the ability to quickly recognise the signs and symptoms of substance abuse is an essential skill for employers and managers in order to safeguard the health and welfare of employees, customers and the general public, as well as the reputation of their businesses. Side effects can vary greatly between different drugs and in this blog we look at the four main drug groups (cocaine, cannabis, amphetamines and opiates) and highlight the most common signs to spot if one of your employees or colleagues is abusing them. Cocaine is rapidly becoming one of the most commonly used drugs on the planet. Incredibly addictive by nature, Cocaine increases the production of dopamine in the brain. It is this dopamine that creates a feeling of euphoria in the user. When the effects of the drug begin to wear off the user craves the euphoric feeling produced by the drug and can very soon become addicted. Cannabis is derived from the Cannabis Sativa plant and other closely related plants often referred to as hemp. Known by many names (such as marijuana, pot, weed, grass, hash, ganja and many more) cannabis is the most used drug globally and the controversy over whether or not to legalise it is still raging on. In the UK cannabis is still an illegal, Class B substance but despite this 6.2% of the population2 admit to using the drug in one form or another. With such high usage, it is not unrealistic to consider the possibility of someone in your workforce abusing this common drug. How can you spot the signs of someone under the influence of cannabis? Amphetamines is a group of drugs that increase the activity levels of certain chemicals in the brain and are often classed as stimulant drugs. Amphetamines are psychoactive substances that cause heightened levels of energy and alertness by amplifying the activity of certain neuro-signalling molecules in the brain. Interestingly, not all amphetamines or stimulants are illegal, many are used in the treatment of conditions such as ADHD with medications including Adderall and Ritalin. The effects of amphetamines will vary depending on the specific substance being used. However, the dangers are the same for all and can be fatal. Spotting the signs of a stimulants abuser can be the difference between life and death. Opiates, such as heroin, are often considered to be one of the most dangerous and addictive drug groups. The substance comes from opium found in the poppy plant. Often available as a white or golden-brown powder, it is also sold as a black sticky substance (tar heroin) or solid black chunks. These forms of heroin can be smoked, snorted or injected. Regardless of how this drug is consumed, the effects take over extremely quickly, with users experiencing ‘the rush’ within just a few minutes. As with all illicit drugs, managing the strength, purity and dosage levels is extremely difficult and overdosing on heroin is a very real and life-threatening side-effect. How can you spot someone using heroin in your workplace? It’s easy to think that substance abuse in the workplace is uncommon and not something that your employees or colleagues would be affected by. However, it is important in all workplace environments to educate and empower your team to spot and report any behaviour that may point to drug use. An active workplace drug testing policy can play a vital role in helping to identify drug misuse by employees and, beyond the obvious safety aspects, it can have additional benefits for a business and its employees. Absenteeism and compromised productivity can be reduced, while organisations can also take steps to support employees with drug problems to help them get the treatment they need. 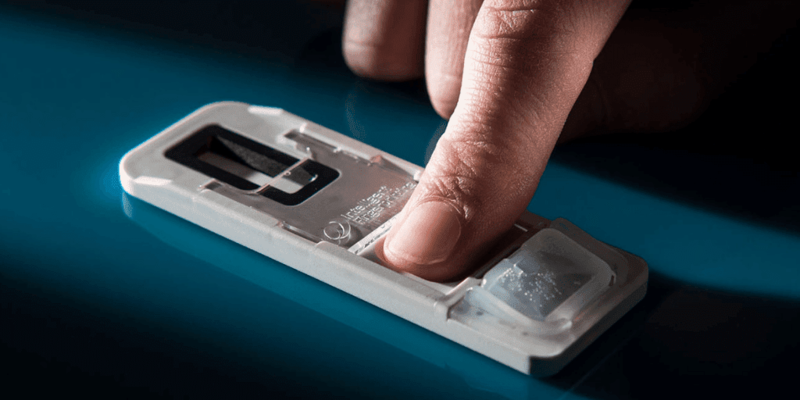 Here at Intelligent Fingerprinting, we’ve developed a revolutionary new fingerprint-based drug test that can support all your workplace drug screening requirements including pre-employment screens, random and regular testing and post-accident investigations. It’s a quick, easy-to-use, hygienic and portable system which can be used anytime, almost anywhere, to screen for drug use from the simple touch of a fingertip. We can also help you develop or update your workplace drug policy and provide drug awareness training. To find out more about our revolutionary technology click here or talk to one of our team here. Please note that the information contained in this blog is intended to provide an introduction to recognising signs of possible drug use and is not an exhaustive list. For more detailed information and advice visit the FRANK website or NHS Choices.